A drive through the winding roads of Olmos Park affords glimpses into the diverse architecture of the neighborhood — Tudor mansions, ranch houses, skeletons of old homes undergoing major renovations. Around a bend on one of the dappled streets lie two houses, one of Mediterranean design and the other fashioned along French New Orleans construction. These two architecturally disparate houses have a great deal in common — an accomplished family and an amazing art collection. The French New Orleans house is the residence of Patricia and Juan Ruiz-Healy and their daughters. The adjacent Mediterranean villa is Patricia’s studio. The Ruiz-Healy residence was built in 1943 and features the long, narrow windows and wrought iron work prevalent in the French New Orleans style. Each room flows gracefully into the next, providing the scaffolding for the art displayed throughout the home. Patricia has been collecting art in one form or another for more than 25 years. A native of Sonora, Mexico, she came to San Antonio in 1997 and settled in Olmos Park with her husband, Juan, and two daughters. Despite her young family’s hectic schedule, she earned a business degree from the University of the Incarnate Word in 2001. Her studies convinced her that she could turn her art passion into a career. She completed a master’s degree in art history from the University of Texas at San Antonio and is a doctoral candidate in Latin American studies with a concentration in art history at the University of Texas in Austin. Her home reflects her passion. She has curated a residence that combines significant modern art with the craftsmanship of Old World furniture, porcelain figurines and silver services. The foyer is floored in terrazzo tile with brass floral inlays. The staircase features an intricate brass and wrought iron banister and handrail leading upstairs. To the right of the entry is Patricia’s personal study with rich red walls complementing the luster of her oak desk and bookcase. Across the foyer is the formal living room, filled with family photos, statuary, paintings and objets d’art. The eclectic furniture is a mixture of antiques and cushioned chairs. How did she pull it all together? “A good friend recommended we choose a Persian rug we really loved. We chose a Kerman rug and built the rest of the room around the colors in the carpet,” she says. The comfortable sofa is flanked by antique end tables from France that Patricia purchased in Mexico. Hand-painted curio cabinets of English satinwood hold treasures purchased during international trips with her family. One of these is a small Sevres porcelain plate depicting a fruit still life painted in exquisite detail. “Can you imagine owning a whole set of these dishes?” Patricia wonders. “Let alone eating from them?” A beautiful cobalt porcelain and ormolu chandelier hangs from an ornate ceiling medallion of the same style as the carved ornamental moldings. Patricia and her husband have collected chandeliers, some of which are antique, over the years, and nearly every room in the house has one. The marble gas fireplace is flanked by famous paintings. Two Picassos and a Kandinsky are displayed near a bronze by Felipe Castenada. Each item in the room is catalogued; Patricia knows the history of the artist and the artwork. Learning about the contents of her home is like taking a personal guided tour of a modern art museum with a learned professor. The formal dining room seats eight. Originally the room had a low, flat ceiling; Patricia converted it to a hip vault style to better accommodate the furnishings and the ornate Baccarat chandelier. The heavy buffet behind the dining table is set with an 1874 silver service. The Italian china cabinet at the end of the room is full of crystal wine glasses, goblets and figurines. Chief among them is a colorful Dresden porcelain centerpiece. The sun room is done in pale aqua tones. A long wall of windows overlooks the red brick patio and landscaped back yard. This room features a hotel-sized Persian Kerman area rug. Over the sofa hangs a 60-by-80-inch landscape painting titled Valle de Oaxaca by Abelardo Lopez and a watercolor by Texan Ray Smith from his Exquisite Corpses series. Several bronzes of Diana the Huntress are displayed around the room. “My husband is fond of figures of Diana the Huntress,” Patricia says as she indicates a bronze statue of the goddess. “A statue and fountain of Diana the Huntress stands in Paseo de la Reforma in Mexico City. This bronze was used as the model for that statue.” Juan’s office is accessed through the sunroom. It’s a masculine room with paneled walls, a red sofa and built-in shelving laden with books, magazines and memories. 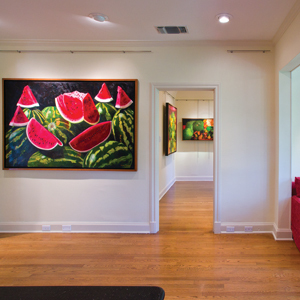 On the far wall hangs an 80-by-99-inch contemporary painting by Sergio Hernandez. Adjacent to it is a large landscape by Abelardo Lopez depicting the countryside around Oaxaca, Mexico. Next to the cabana is a flagstone patio with a bar area and barbecue. The large swimming pool becomes an arcing fountain with the flip of a switch. Scattered across the property are large iron sculptures by local artist George Schroeder and Javier Marin from Mexico. “I started working with Latin American artists, but little by little I have included local artists. I am very interested in this dialogue of artists from here and abroad,” says Patricia.